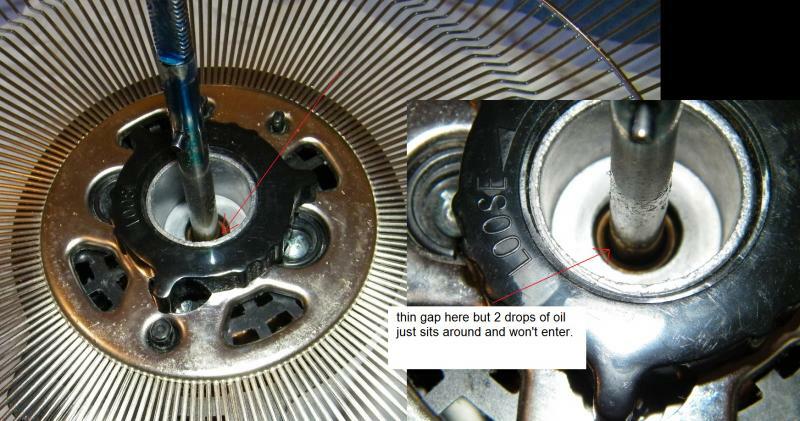 When you drop a few drops down the shaft it looks like it only lubes around the spinning shaft itself & not getting much into the bearings, is there sufficient oil up near the actual bearings when oiled this way? Should those shielded bearings be oiled directly? The rear bearing set on my fan looks to be lubricated by the grease that inevitably exits the oscillating chamber as the shaft spins. should I still oil that area or just let the grease sit over the shaft? How often should I oil if used for 7 hours a day every day? Yearly? every 6months? etc. The answer is not that easy, it really depends on the fan. For example, most Emerson fans hold a significant amount of oil, but by contrast, Eskimo and other dime store fans hold very little and need to be oiled more regularly. There generally is a wick of some sort, whether accessible or not, that holds an oil reserve. Yes, many fans that have a greased oscillator box, do not have an oil cup or other means of oiling. They relied on the grease breaking down and giving up some oil to lubricate the shaft. Personally, I like to oil that bearing, especially when reassembling a newly restored fan. Just don’t oil too much or the oscillator box will begin to fill with the excess oil. As far as how often. Again, it depends on the fan. If it depends on wick oilers, probably running it 7 hours a day, every day, I’d oil it every couple months, or if it begins to get noisy or run slower than usual. Emersons have a large reservoir and their advertising bragged that their fans only needed oil once a year. Post a pic of your fan and we can give you better suggestions. Lane Shirey wrote: Post a pic of your fan and we can give you better suggestions. Hi Lane, here is a photo showing what fan i have, also this is similar to other fans from long ago. This is the only place i can see to apply the 3 in 1 machine oil, but it simply won't go into the thin gap surrounding the shaft. It looks the same on the other side when i take the fan apart. The oil will not enter this thin gap and just sits around it even if left for a few hours. So how should this be lubricated? Can i use silicon spray lube? That stuff is thin enough to enter such gaps. to try to work the oil into the bushing. Do not use 3 in 1 Oil in the Red can. Only use 3 in 1 in the blue can. Or get some synthetic oil. Hi John,I tried this and no oil gets in the gap at all, I'm using 20SAE. John McComas wrote: To get the oil into where it should be, in the oil felt/wicking, you would need to take the motor apart......! What is the oil felt wicking? Its a shroud frame like thing around the spinning shaft with a filter like material in it? One fan I brought new run 2years everyday without any oiling at all, then just stop spinning or start making loud noises. So I tried some oil on the shaft & it gives about a few more days before loud noises start. What can I do? Unfortunately, modern fans like this aren't intended to be oiled. The only thing you can try is taking the motor apart and looking if you can add oil to the rear of the bearing. Bearings like this are made of a porous bronze, and until recently were surrounded by a piece of felt or similar fabric soaked in oil; usually with an opening in the motor housing to drip oil down. This would seep through the bronze as it heated up, oiling the shaft. Just dripping oil onto the bronze piece alone will not make it soak much oil up, leading to slowdowns or squeaks after a couple weeks or months. Gunner Lake wrote: Unfortunately, modern fans like this aren't intended to be oiled. The only thing you can try is taking the motor apart and looking if you can add oil to the rear of the bearing. Bearings like this are made of a porous bronze, and until recently were surrounded by a piece of felt or similar fabric soaked in oil; usually with an opening in the motor housing to drip oil down. This would seep through the bronze as it heated up, oiling the shaft. Just dripping oil onto the bronze piece alone will not make it soak much oil up, leading to slowdowns or squeaks after a couple weeks or months. 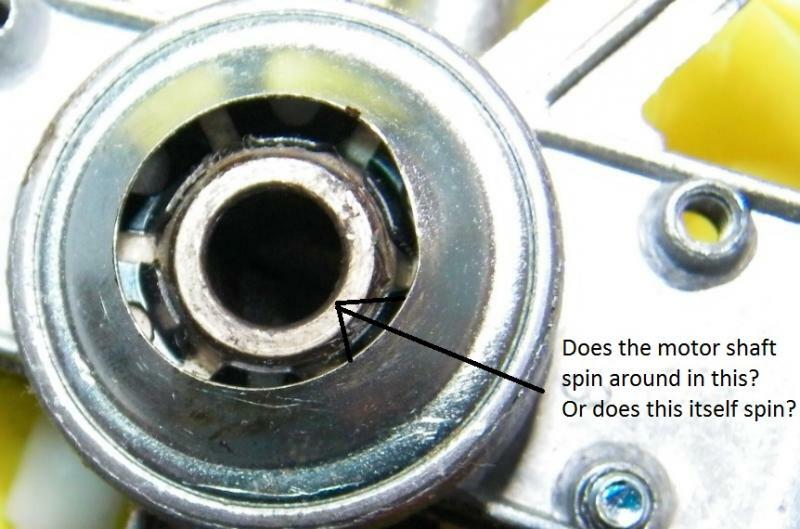 The rear of the bearing can be accessed by taking apart the motor but how many drops of oil to soak in the felt? 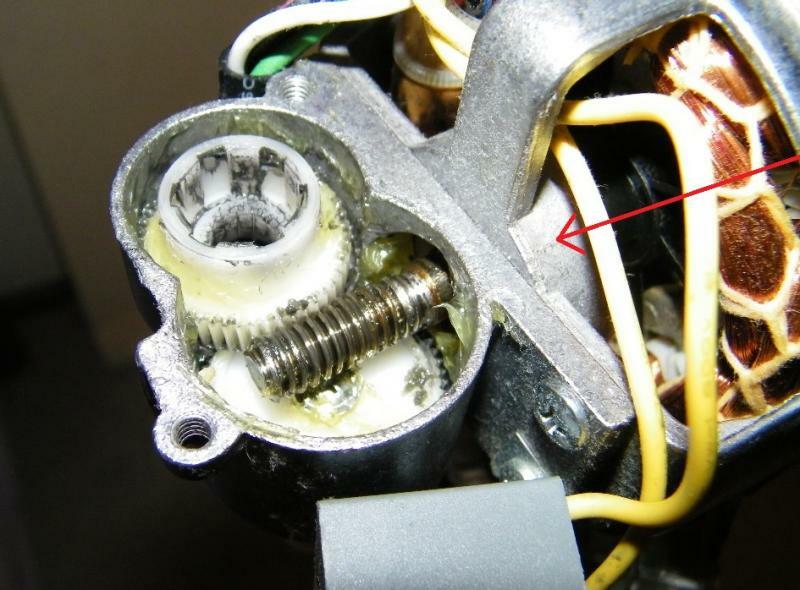 Also here is a picture with arrow showing the rear bearing, can you please tell me if this rear bearing is self lubricated by the reservoir of grease or does it require oil like the front? Unfortunately your fan has what are called "permanently lubricated" bearings or in other words bearings that aren't meant to be serviced by the customer, which how it works is that the motor has felt wicks around the bearings that they preload with a set amount of 20 weight oil and then they permanently seal the bearings in a way so that dirt and dust doesn't get in and contaminate the bearings and basically that oil soaked felt wick around the bearings if they remain sealed and uncontaminated then the "permanently lubricated" bearings can stay lubricated for up to 30 years or so until the oil finally dries out and the motor seizes up or starts making noises, the only way to lubricate one of these motors is to drill a small hole in the bearing housing making sure you don't damage the bearing and then drop several drops of fresh 20 weight oil into the bearing housing which will be soaked up by the wicking material inside and then seal the hole with solder. Levi Mevis wrote: Unfortunately your fan has what are called "permanently lubricated" bearings or in other words bearings that aren't meant to be serviced by the customer, which how it works is that the motor has felt wicks around the bearings that they preload with a set amount of 20 weight oil and then they permanently seal the bearings in a way so that dirt and dust doesn't get in and contaminate the bearings and basically that oil soaked felt wick around the bearings if they remain sealed and uncontaminated then the "permanently lubricated" bearings can stay lubricated for up to 30 years or so until the oil finally dries out and the motor seizes up or starts making noises, the only way to lubricate one of these motors is to drill a small hole in the bearing housing making sure you don't damage the bearing and then drop several drops of fresh 20 weight oil into the bearing housing which will be soaked up by the wicking material inside and then seal the hole with solder. What about applying oil drops in the felt wicks? I can see them and reach them and the oil looks to be soaked up by the wick, will this at least stay lubricated for some time? One thing i still don't understand is the spinning shaft is very tightly sitting in the bearing housing, is the motor shaft suppose to spin within the surrounding tight cylinder, if so how does it get lubricated as i see no internal holes. Hey Bruce, it looks like you''ll be able to add oil to the wicks in those cups, so good news there. It's up to you if you want to add a hole in the housing to add oil later, or if the housing comes apart easily with one or two screws then the work might not be worth it. The bronze center piece you pointed out does not spin, though it can pivot slightly to allow aligning the bearings to the shaft. As I said in my earlier comment: "Bearings like this are made of a porous bronze... [oil] would seep through the bronze as it heated up, oiling the shaft." Gunner Lake wrote: Hey Bruce, it looks like you''ll be able to add oil to the wicks in those cups, so good news there. It's up to you if you want to add a hole in the housing to add oil later, or if the housing comes apart easily with one or two screws then the work might not be worth it. Yeah I now finally understand how this all works, takes about 2-3mins to take apart. But the wear on motor screws from taking it apart too many times has me worried, If I re oil the felt with decent amount of oil hopefully I don't have to do it again for another year or two. I run this fan 6-7hours a day each week. I have seen GE hassock fans that have a sealed end cap and inside of that cap is a wick surrounding the motor bearing which I soaked with 20 weight motor oil or turbine oil. The end cap is on the bottom of the fan motor and GE uses the single bearing type motor. The current draw for this fan on high speed is 2.5 amps. once I oiled the wick the motor spin down time improved greatly. The rubber plugs that join the blades to the shaft do come loose and create a squealing noise I have used Gorilla Glue to reseal the rubber plugs and prevent the blade from spinning on the shaft and thus improve air flow. Page processed in 0.1670 seconds (12% database + 88% PHP). 33 queries executed.